Animaroo Alpacas has been servicing the United States with Alpacas and Alpacas products since 2006 when we first opened our doors to the public. We pride ourselves on supplying the public with the choicest Suris and Huacayas from top breeders in the United States. When considering an Alpaca for purchase, it is important to research the alpaca breed to know which species is the best for your lifestyle. While the temperament of the species varies, Alpacas on the whole are very gentle animals with a sweet disposition. Both the Suri and the Huacaya vary in temperament as well as appearance. The main difference in the Alpacas are their fleece. The Huacayas have a very soft, luxurious feeling such as cashmere and is crimped, while the Suri is a straight elegant strands of hair that fall almost that of a drape. Purchasing an Alpaca at Animaroo Alpacas is safe. We cross verify each of our Alpaca breeders for quality, ethics and responsibility. 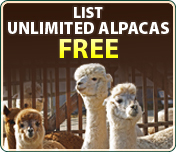 We set high standards for our Alpacas breeders and any breeders who do not meet these standards will not be accepted. Take a look around, ask questions- our breeders are here to help. You will find many ARI alpacas for sale in Florida, California, New York, Tennessee as well as the other US states and cities.